"Thou Art the Ruler o the Minds o Aw People"
claimed but uncontrolled regions shawn in licht green. Hindi in the Devanagari script is the offeecial leid o the Union. Inglis is an addeetional co-offeecial leid for Govrenment wirk. Indie ( i/ˈɪndiə/), offeecially the Republic o Indie (Bharat Ganrajya), is a kintra in Sooth Asie. It is the seivent-lairgest kintra bi geographical aurie, the seicont-maist populous kintra wi ower 1.2 billion fowk, an the maist populous democracy in the warld. Mainland Indie is boondit bi the Indian Ocean on the sooth, the Arabie Sea on the wast, an the Bay o Bengal on the east; an it is bordered bi Pakistan tae the wast;[note] Bhutan, the Fowkrepublic o Cheenae an Nepal tae the north; an Bangladesh an Burma tae the east. In the Indian Ocean, mainland Indie an the Lakshadweep Islands are in the vicinity o Sri Lanka an the Maldives, while Indie's Andaman an Nicobar Islands share maritime mairch wi Thailand an the Indonesian island o Sumatra in the Andaman Sea. Indie haes a coastline o 7,517 kilometres (4,700 mi). Hame tae the auncient Indus Valley Ceevilisation an a region o historic tred routes an vast empires, the Indian subcontinent wis identified wi its commercial an cultural wealth for muckle o its lang history. Fower o the warld's major releegions—Hinduism, Buddhism, Jainism an Sikhism—oreeginatit here, while Zoroastrianism, Judaism, Christianity an Islam arrived in the first millennium CE an shapit the region's diverse cultur. Gradually annexed bi the Breetish East India Company frae the early 18t century an colonised bi the Unitit Kinrick frae the mid-19t century, Indie became an independent naition in 1947 efter a struggle for unthirldom which wis merked bi a non-violent resistance led bi Mahatma Gandhi. Indie is a federal constitutional republic wi a parliamentary democracy consistin o 28 states an seiven union territories. A pluralistic, multilingual an multiethnic society whaur mair nor 300 leids are spoken, Indie is an aa hame tae a diversity o wildlife in a variety o pertected habitats. The Indian economy is the warld's eleivent lairgest economy bi nominal GDP an the fowert lairgest bi purchasin pouer parity. Syne the introduction of mercatt-based economic reforms in 1991, Indie haes acome ane o the fastest growin major economies in the warld; housomeivver, the kintra continues tae face several poverty, illiteracy, corruption an public heal relatit challenges. Indie is clessifee'd as a newly industrialised kintra an is ane o the fower BRIC naitions. It is the warld's saxt de facto recognised nuclear weapons state an haes the third-lairgest staundin airmed force in the warld, while its military expenditure ranks tent in the warld. Indie is a regional pouer in Sooth Asie. It is a foondin member o the Unitit Naitions, the Non-Aligned Movement, the Warld Tred Organisation, the Sooth Asian Association for Regional Cooperation, the East Asie Summit, the G20 an the G8+5; a member o the Commonweel o Naitions; an an observer state in the Shanghai Cooperation Organisation. The name Indie is derivit frae Indus, which is derivit frae the Auld Persian wird Hindu, frae Sanskrit सिन्धु Sindhu, the historic local appellation for the Indus River. The auncient Greeks referred tae the Indians as Indoi (Ινδοί), the fowk o the Indus. The Constitution o Indie an common uisage in various Indian leids an aa recognise Bharat (pronoonced [ˈbʱaːrət̪] ( listen)) as an offeecial name o equal status. The name Bharat is derivit frae the name o the legendary keeng Bharata in Hindu scriptures. Hindustan ([ɦɪnd̪ʊˈst̪aːn] ( listen)), oreeginally a Persian wird for “Land o the Hindus” referrin tae northren Indie, is an aa occasionally uised as a synonym for aw o Indie. ↑ 1.0 1.1 1.2 1.3 National Informatics Centre 2005. ↑ "Profile | National Portal of India". India.gov.in. Retrieved 23 August 2013. ↑ Meenistry o Home Affairs 2011. ↑ 8.0 8.1 8.2 8.3 "Report for Selected Countries and Subjects". World Economic Outlook Database, International Monetary Fund. 27 October 2013. Retrieved 28 February 2014. ↑ "INDIA STATS : Million plus cities in India as per Census 2011". ↑ "Andaman & Nicobar Command – Indian Navy". Indiannavy.gov.in. Retrieved 2010-08-23. ↑ Oldenburg, Phillip. 2007. 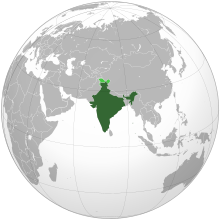 "India: History[deid airtin]," Microsoft Encarta Online Encyclopedia 2007. Archived 1 November 2009. ↑ "India is the second fastest growing economy". Economic Research Service (ERS). United States Department of Agriculture (USDA). Retrieved 5 August 2007. ↑ Mauro F. Guillén (2003). "Multinationals, Ideology, and Organized Labor". The Limits of Convergence. Princeton University Press. pp. 126 (Table 5.1). ISBN 0-69-111633-4. ↑ "Indian Armed Forces, CSIS (Page 24)" (PDF). 25 July 2006. ↑ Perkovich, George. "Is India a Major Power?" (PDF). The Washington Quarterly (27.1 Winter 2003–04). Retrieved 2007-12-13. ↑ "Official name o the Union". Courts Informatics Division, National Informatics Centre, Ministry of Comm. and Information Tech. Retrieved 8 August 2007. Name and territory of the Union- India, that is Bharat, shall be a Union of States. ↑ "Hindustan". Encyclopædia Britannica, Inc. 2007. Retrieved 18 June 2007. Wikimedia Commons haes media relatit tae India. This page wis last eeditit on 14 Apryle 2019, at 18:49.